MILLER, Rebecca L. (2017) Libraries are more than "book houses" - Developing active libraries in Afghanistan. Paper presented at: IFLA WLIC 2017 – Wrocław, Poland – Libraries. Solidarity. Society. in Session 112 - Poster Sessions. The word for “library” in Dari, one of the national languages of Afghanistan, is “kitab-e khaana” or “book house.” Unfortunately, this has come to connote warehouse more than a home, nothing more than a space to store books and not a vibrant source for information seekers. Afghan libraries have a long way to go to overcome years of neglect, yet a few are managing to become a strong foundation for literacy and research. 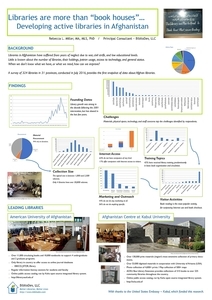 A recent survey of 324 libraries in Afghanistan conducted by the author showed that shortages of appropriate books, lack of Internet access (even lack of basic utilities), and untrained library staff hamper the development of libraries as access points to information crucial in a developing nation. However, a few libraries are leading the way forward. 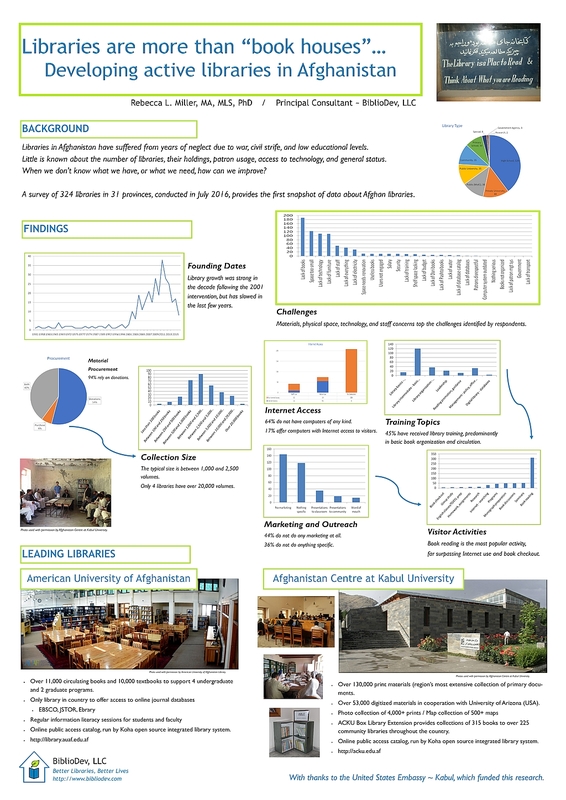 This poster will present information about the Afghanistan Centre at Kabul University (ACKU), the American University of Afghanistan (AUAF) library, and the Lincoln Learning Centers system of libraries across Afghanistan. Graphs and figures will summarize pertinent data from the survey. Color photographs will illustrate brief text statements describing the libraries mentioned and comparing them to examples of more typical Afghan libraries.